At the end of his filibuster that lasted nearly 12 hours, Sen. Rand Paul (R-KY) got some last-minute support from one of his fellow GOP U.S. Senators running for president: Sen. Ted Cruz (R-TX). Cruz, who doesn’t entirely agree with Paul on National Security Agency (NSA) bulk data collection as contained in the PATRIOT Act’s Section 215, came to the floor to applaud Paul’s big move for liberty. “I thank the senator from Kentucky,” Cruz said when he took the floor. “I would note he and I agree on a great many issues, although we don’t agree entirely on this issue, but I want to take the opportunity to thank the senator from Kentucky for his passionate defense of liberty. His is a voice that this body needs to listen to. Cruz, who supports the USA Freedom Act as it stands—Paul does not, and wants an open amendment process to the bill, which Senate Majority Leader Mitch McConnell isn’t agreeing to—noted his support for the bill. “It protects our privacy rights and the bill of rights of law-abiding citizens but ensures we have the tools to prevent acts of terrorism,” Cruz said of the USA Freedom Act. “Now, I would note two points that are important. There are a number of members of this body, including a number of members of my party and the party of the senator from Kentucky, who argue the PATRIOT Act should be reauthorized with no changes and they argue to do anything else would jeopardize our national security. “Well, there are two facts that are critical to assess to responding to that argument. Number one, members of this body have received confidential classified briefings from the national security officers of this administration. We are not at liberty to convey the specific details of those briefings. But the members of this body have been told, number one, that the U.S.A. Freedom act would provide effective tools so that we could prevent acts of terrorism. And indeed they have gone further to say that it is entirely possible that under the U.S.A. Freedom act, the national security team would have more effective tools to stop actual terrorists than they do today under the bulk metadata collection of law-abiding citizens. That’s worth underscoring. Cruz also called out his GOP colleagues who want such an open reauthorization of the PATRIOT Act—a blanket reauthorization—by noting there aren’t enough votes for it in the House or the Senate. “Even if that is their preference, it is abundantly, abundantly clear that a clean reauthorization of the PATRIOT Act ain’t passing this body and it certainly ain’t passing the house of representatives. I would note that the U.S.A. Freedom Act passed the House of Representatives 338-88. It wasn’t a narrow victory. It was overwhelming. Cruz also said there should be open debate and votes—what McConnell is blocking on Paul’s amendments and anyone’s amendments to the USA Freedom Act. 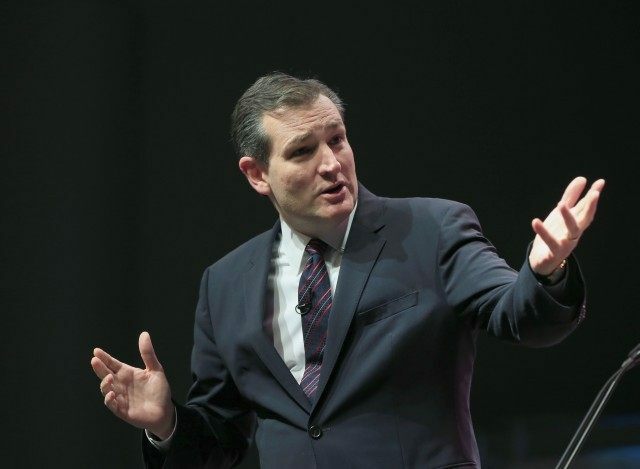 “I will say this, with my friend the senator from Kentucky, I entirely agree that he is fully entitled to introduce his amendments to that bill, that this body should engage in a full and open debate considering amendments and the senator from Kentucky should be able to propose reasonable commonsense improvements to the U.S.A. Freedom act,” Cruz said. “We ought to debate them on the merits in a full and open process. There was a time not too long ago when this body was called the world’s greatest deliberative body. Cruz also discussed his and Paul’s history of filibusters. “I will note standing here that the senator from Kentucky, with the senator from Utah at 11:40 P.M., I’m reminded of the movie ‘The Blues Brothers’ saying, ‘Jake, we’ve got to get the band back together again,’” Cruz said. “I’m reminded of previous evenings standing here with this same band of brothers in the wee hours of the morning. And I’ll make a couple of final observations in this question. The first is the very first time I ever spoke on the Senate floor, when I was a brand-new freshman senator, was during the last time the senator from Kentucky was filibustering. “Senator Rand Paul was filibustering against the Obama administration’s policy of uncontrolled drone strikes and the refusal of the Obama administration to acknowledge that the constitution prohibits the federal government from using a drone to target a united States citizen with lethal force if that citizen does not pose an imminent threat on U.S. Soil. Cruz noted that when he spoke, he spoke of the Alamo—it was the anniversary of that Texas Revolution battle. Cruz also said that Paul gave him “two pieces of advice” when he did his filibuster against Obamacare some months later in 2013. “Advice number one, he said, was wear comfortable shoes,” Cruz said. “And I would note Senator Paul observed that the last time he did that, he didn’t follow this advice. He hadn’t planned to speak as long as he had. He told me his feet hurt for two weeks. And I will confess it was to my great shame I’m wearing today my argument boots which I wear every day on the Senate floor. But when I filibustered on Obamacare, I shamefully left my boots in the closet and went and purchased black tennis shoes. And as the hours wore on, I was very, very grateful that I had abided by Senator Paul’s good advice and wore the tennis shoes. “And I would note as I’m sitting here today that the good senator is wearing tennis shoes today. So I’m glad to see that he followed his own advice, and I have no doubt that his calves and thighs will thank him tonight and in the morning.